Comment un slogan publicitaire anglais est «traduit» en français, loi Toubon oblige. As you probably know, there is a law in France, called “loi Toubon” after the former minister of culture who sponsored it, that requires all product descriptions and adverts (“be they in spoken, written or audio-visual form”) to be in French. If several languages are present (read: if the slogan is in English) the French version has to be at least as prominent, readable, audible, comprehensible as the foreign original. You probably know as well that this law has been much ridiculed, M. Toubon been nicknamed Mr AllGood (tout=all, bon=good), and that no one really obeys. All over the billboards there are slogans in English with no French translation in sight … except when you look very closely along the edge of a poster. Then you might be able to decipher some French equivalent, printed in 2 cm high letters on a billboard that measures five metres by three. The opposite of a fig leaf, in a sense. 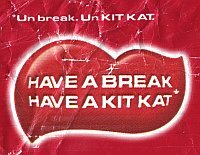 On the Kitkat bar I ate the other day (“Have a break, have a Kitkat”), it wasn’t the difference in size that got my attention, but the decidedly minimalist approach to the translation problem. Here is a scan of the relevant part of the wrapper.